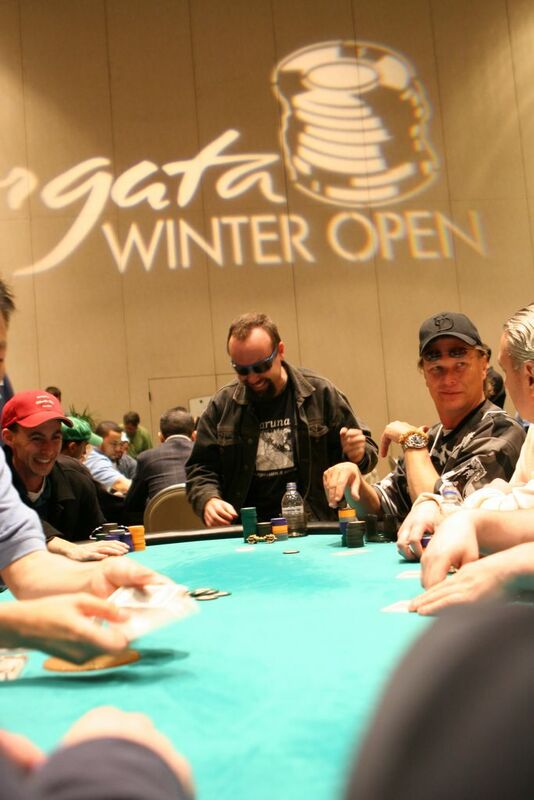 The Borgata Winter Poker Open continues with Day Three of the championship main event. Action will begin at Noon with 33 players remaining out of the original 381 entrants who all bought in for $10K. 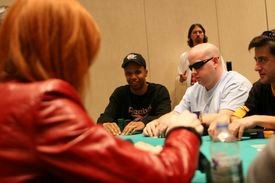 The winner gets $1.1M and a seat in the $25,000 World Poker Tour Championships at the Bellagio in April, along with a brand new 2006 Escalade. 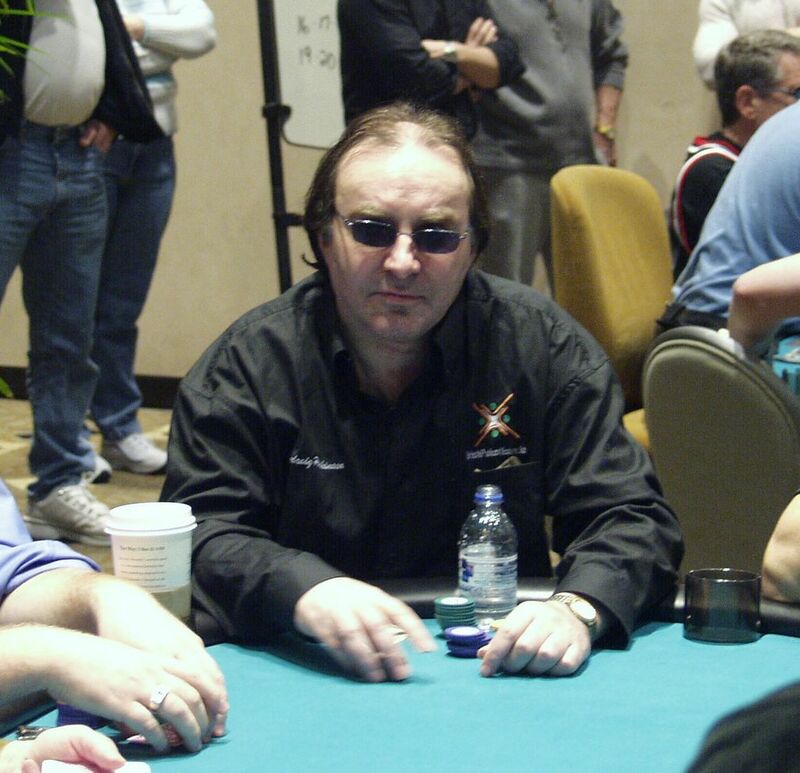 The second day started with 165 players and Cliff "Johnny Bax" Josephy as the chipleader. When the day completed, only 33 were left with chips. 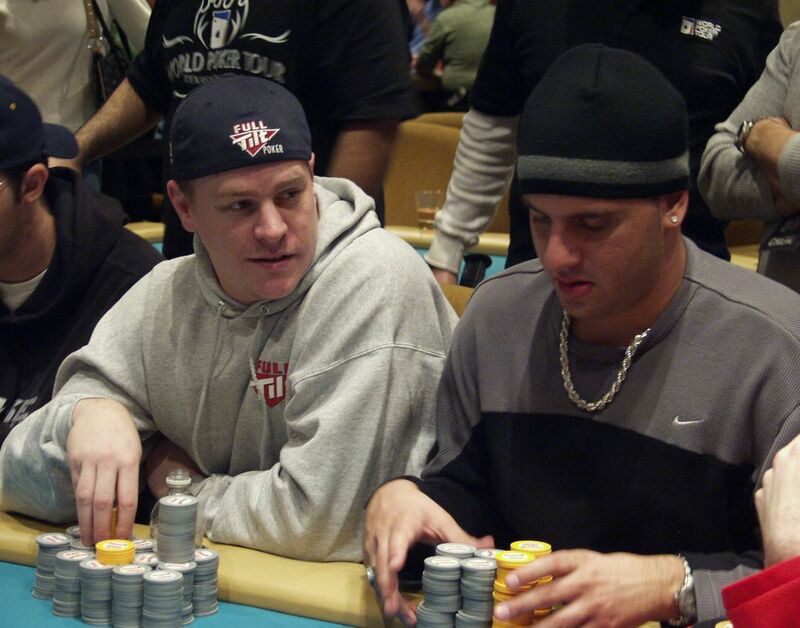 Some notable pros eliminated on day two included Andy Black, Joe Sebok, Barry Greenstein, Scotty Nguyen, John Juanda, "My Main Man" Freddy Deeb, Matt Hilger, Carlos Mortensen, Chris Fargis, Gavin Smith, David Williams, Matt Matros, Steve Dannenmann, Brian Haveson, Steve Brecher, Alan Schein, and Tex Barch. 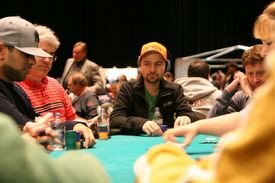 The money bubble came and went and Ted Forrest bubbled out in 76th place winning a free seat in September's main event here at the Borgata. Josephy let the chiplead slide out of his hands late in the evening when John D'Agostino went on a tear. 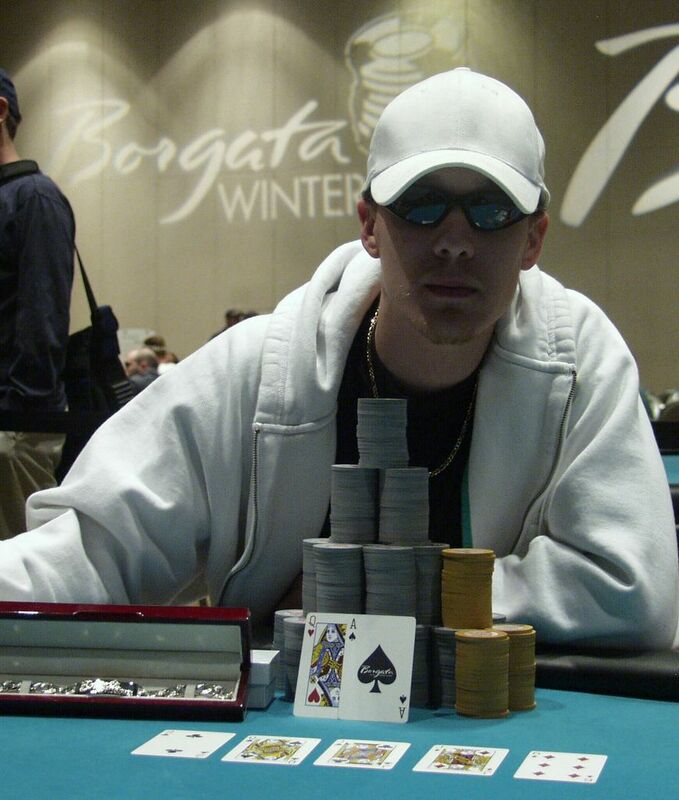 He has close to $1 million in chips and is trying to make another final table at the Borgata. 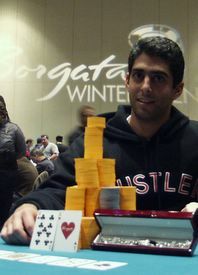 Last September, D'Agostino took 4th place in the Borgata Open that was won by Al Ardebili. Erick Lindgren rivered a Royal Flush and ended the day in the Top 10 in chips. Louise Francouer ended the day near the top. A few days ago, she took third in the Ladies Event. 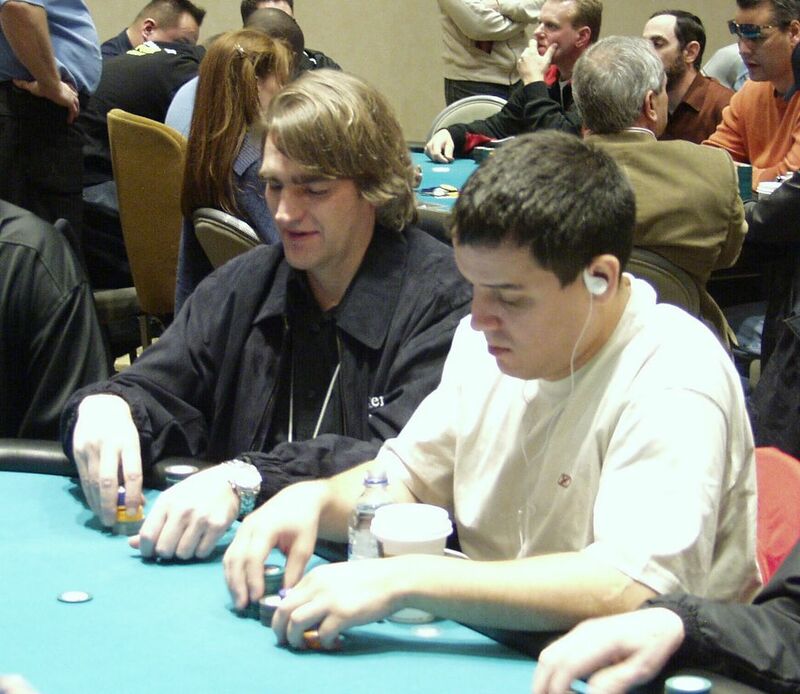 The Grinder has a big stack along with EPT creator John Duthie. 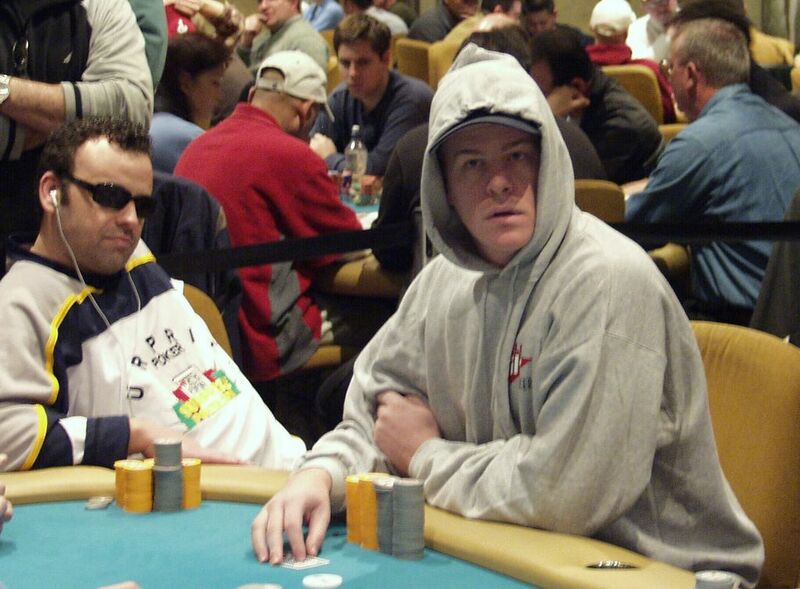 WSOP bracelet winners Denis Ethier and Erik Seidel are both alive. 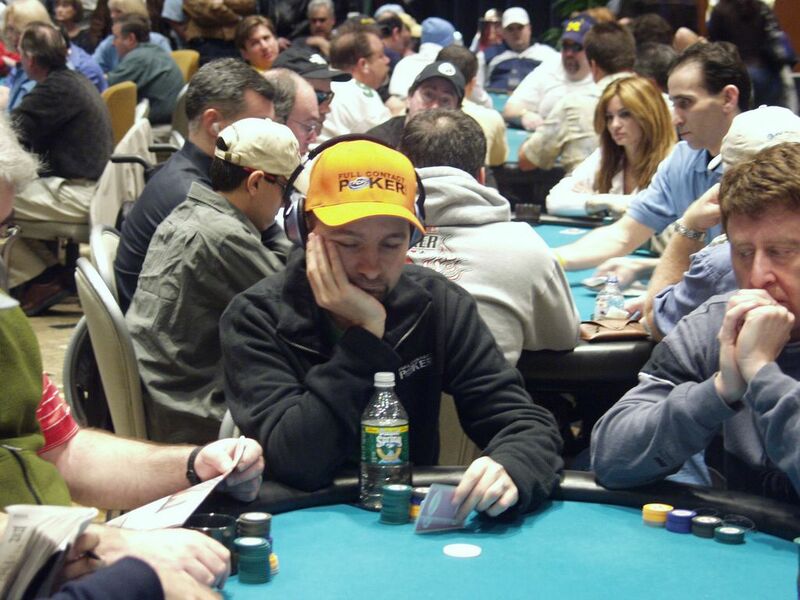 Ethier had been playing well all week and is seeking out another final table. He's already made two final tables in the past week finishing in second and fifth in those events. If there was an award for best player at the 2006 Borgata Winter Poker Open, it would be Denis Ethier. By the end of Day 3, we'll be down to six players and find out who's gonna make the next WPT final table. 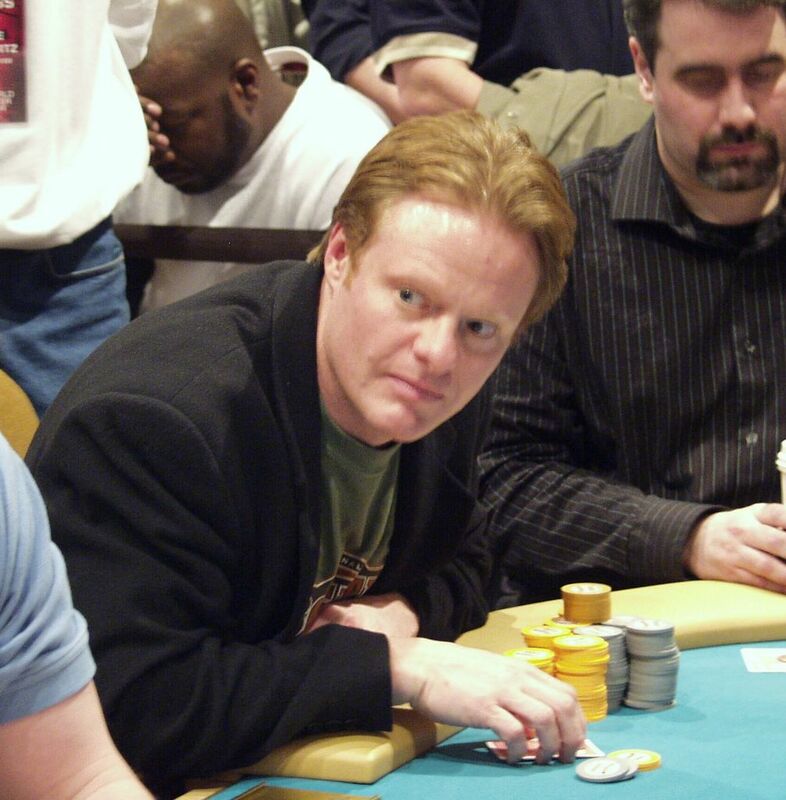 11:40am... Main Event update: Apologies to Greg Cash, who I incorrectly identified in the top 10 in chips. He told me he was "on life support" and had friends calling him up all morning. Sorry Greg. The chip cont has been fixed. 12:03pm... Main Event update: Players are unbagging their chips and action will begin shortly. 12:08pm... Main Event update: Cards are in the air. We have 56 minutes left of this level. Blinds are $8K/$16K with a $1K. 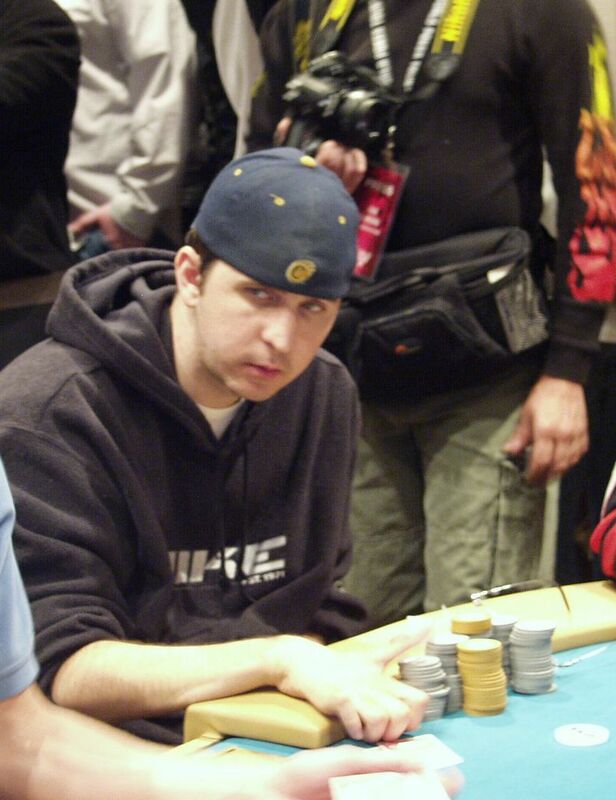 12:09pm... Main Event update: On the first hand, Erik Seidel pushed all in from early position. The Grinder in the big blind mucked The Hammer (7-2o) face up. 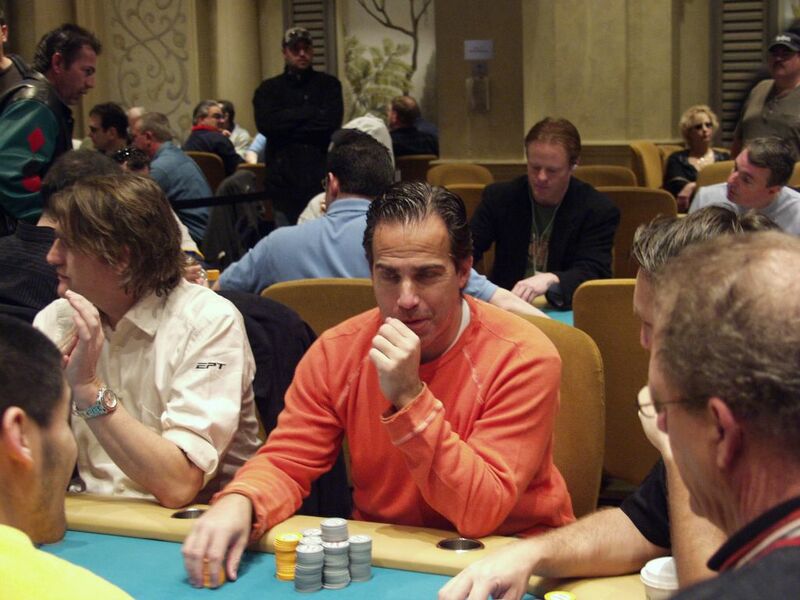 Erik Seidel is out in 33rd place after he was busted by Dennis January who called with Q-Q. Seidel won $14,783. 12:20pm... Main Event update: Denis Ethier picked up A-A and busted Marc Nantais in 32nd place. 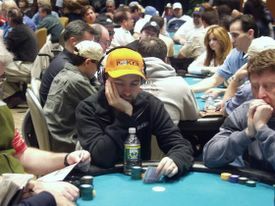 The Grinder busted Chris Reslock in 31st. Reslock moved all in with 6-6 and The Grinder flopped two pair with K-10. Leonard Green busted in 30th. Greg Cash finished in 29th when he was busted by Vlad Mezheritsky. 28 left with the action moving fast. 12:30pm... Main Event update: Here are some photos from today. 12:35pm... Main Event update: Jorge Arias is out after his 10-10 ran into Dan Jorgenson's Q-J. Jorgenson rivered a straight. 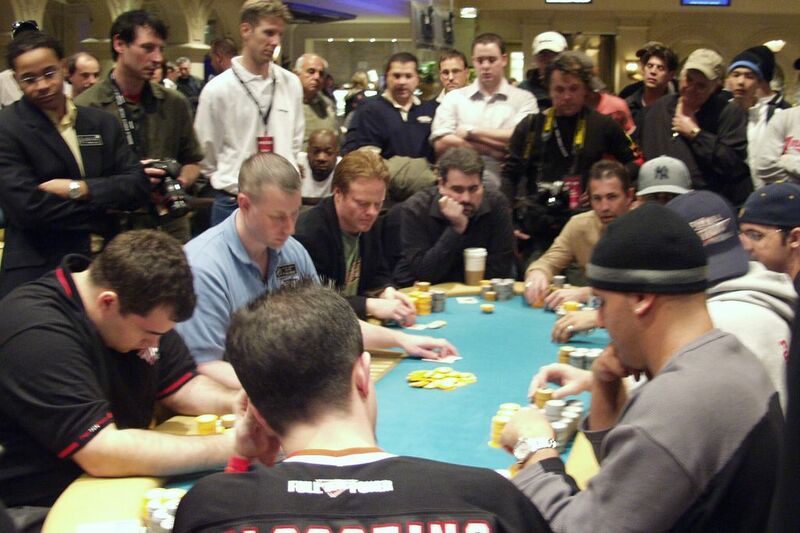 There are 27 players left on three tables. 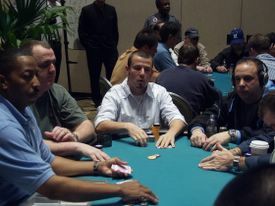 Players have redrawn for seats. 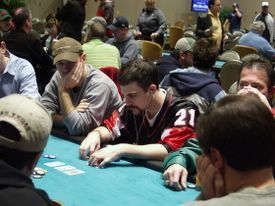 12:55pm... Main Event update: Mike Sica from North Brunswick, NJ was busted when his 10-9s lost to Dennis January's 8-8. He graciously stopped by the media table and explained to us his bustout hand. 1:10pm... Main Event update: Vlad Mezheritsky has been eliminated by Kenny Schuyler in 26th place. 1:20pm... Main Event update: Players are on a break. John D'Ags lost the chiplead. 1:35pm... Main Event update: We're on Level 17. Blinds are $5K/10K with a $1K ante. Ronnie Cauthen got crippled when his J-J lost to Don Mullis' A-Q. He was out in 25th place soon after. 1:45pm... Main Event update: Bill Edler is out in 24th place. His K-J ran into Grinder's J-2s. 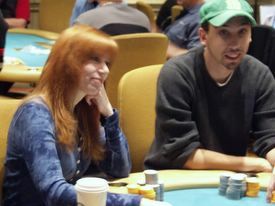 1:55pm... Main Event update: John Duthie scooped a big pot and Louise Francoeur took one off of The Grinder. 2:00pm... Main Event update: Denis Ethier and 9-9 ran into CLiff Josephy's A-A. Ethier was eliminated in 23rd place. Jim Lester took 22nd when Louise Francoeur's A-A eliminated his 8-8. She now has over $600K. 2:15pm... Main Event update: John Duthie's stack took a hit from Eugene Todd and slipped to 500K. 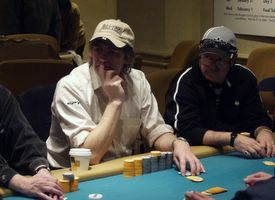 A few hands later, John Duthie put Erick Lindgren to the test in a hand that lasted almost ten minutes. 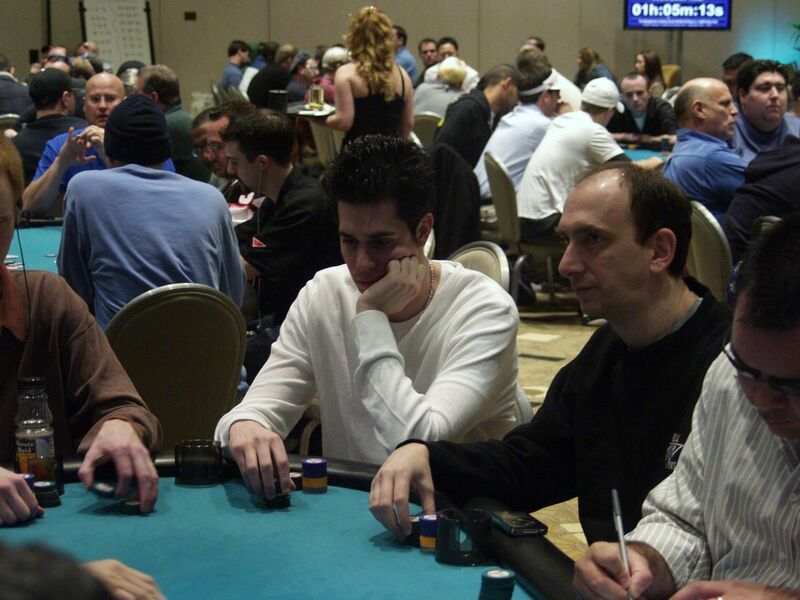 During the hand, at the table right next to Duthie-Lindgren's table, John D'Agastino lost a race to Don Mullis. D'Ags had Q-Q and Mullis' A-K won the race. He flopped a King and rivered an ace. That hand unfolded while Erick Lindgren deliberated over John Duthie's all in bet on the turn. With two diamonds on the board and a King, Duthie made a stab at the pot with K-3s. Lindgren thought forever and finally called with A-K. His hand held up and Duthie was crippled. 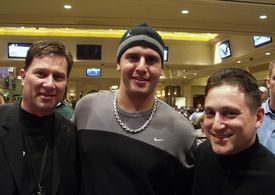 John Duthie was eliminated soon after. 2:20pm... Main Event update: Richard Kirsch is out in 20th place. Dennis January is out in 19th place. We're down to 18 players and the final two tables. Players are redrawing for seats. 3:05pm... Main Event update: We're on a break. 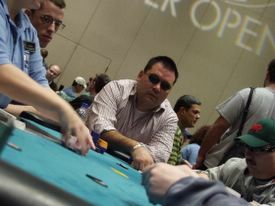 When the players return, they will be at Level 18 Blinds $6K/$12K. 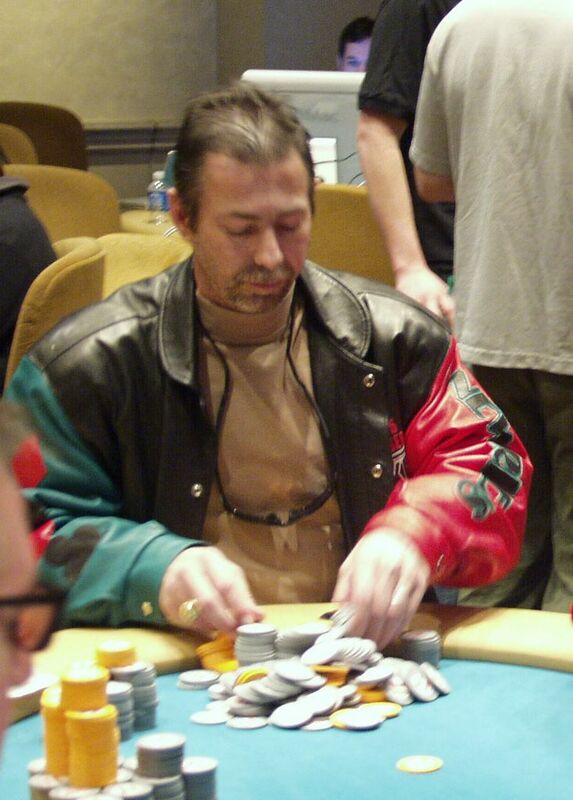 3:25pm... Main Event update: Pete Skyllas has been eliminated in 18th place. 3:35pm... Main Event update: Dane Jorgensen, sporting a black hat that read "I didn't come here to lose," got into a raising war preflop with The Grinder. When it was all done, they were both all in preflop and the Grinder flipped over pocket Queens while Jorgensen showed J-J. The Grinder busted Jorgensen in 17th place. 16 remaining. The Grinder leads the pack with Erick Lindgren not far behind. 4:00pm... Main Event update: The Grinder and Kenny Schuyler tangled heads up. The Grinder raised preflop with A-10s and Schuyler called. On a board of 4-2-Q-Q-8, the Grinder checked to Schuyler who bet out 150K. 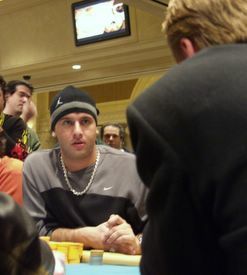 The Grinder thought Schuyler was trying to steal the pot and he thought about calling for a very long time, long enough that he asked the Tournament Director Tab if he could call a clock on himself. That drew a few chcukles from everyone at the table and on the rail. The Grinder reluctantly mucked his A-10s face up and Schuyler showed K-Q for trip Queens. 4:12pm... Main Event update: Will Tong is out when his A-8 ran into Amnon Filippi's A-J. 4:20pm... Main Event update: Players are on a 15 minute break. 5:00pm... Main Event update: We have two more bustouts. Gene Todd was knocked out by Josh Spiegelman. Erick Lindgren's J-J sent Michael Goodman's 8-8 to the rail. He has over $1.8M. 5:15pm... Main Event update: Richard Dabal is on life support. 5:20pm... Main Event update: Dabal is done. He was busted in 13th place when his J-3 was run down by Amnon Filipi's 3-3. 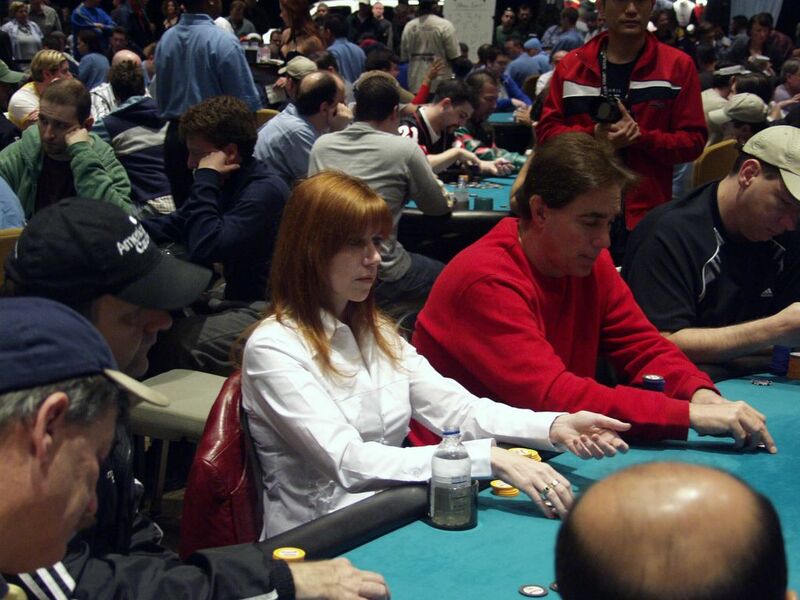 5:33pm... Main Event update: Louise Francoeur is out. Her Q-Q ran into Peter Feldman's A-A. She finished in 12th in an amazing run and she ended up being the last female to be eliminated from this event. 5:53pm... Main Event update: Players are on a one hour dinner break. See you around 7pm. 6:55pm... Main Event update: Players are back. Level 20. Blinds are $10K/20K with $3K antes. 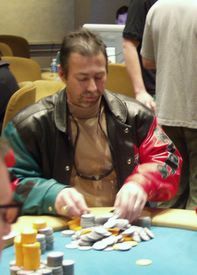 7:10pm... Main Event update: Cliff "Johnny Bax" Josephy was just busted by The Grinder in 11th place. The Grinder raised preflop and Josephy called. On a flop of 5-7-9, Josephy checked and the Grinder moved all in. Josephy quickly called with 9-7s. The Grinder showed Q-Q. The turn was a Queen which gave The Grinder a set and the lead. His hand held up and he busted Josephy in 11th place winning $27,718. We reached a final table of 10 players. 7:30... Main Event update: A Tale of Two Pocket Tens... Erick Lindgren limped in with 10-10 and when John D'Agostino moved all in, Lindgren mucked. D'Ags showed 10-10. 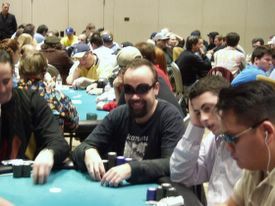 8:00pm... Main Event update: John D'Ags is on life support as one of the shortstacks, while Lindgren keeps adding to his. 8:15pm... Main Event update: Players are on a break. Still 10 left. Lindgren has $1.9M in chips. 8:30pm... Main Event update: We're on Level 21. Blinds are $12K/24K with a $4K ante. 9:00pm... Main Event update: D'Ags is making a run. He has over $600K now. The Grinder made a monster laydown with A-K. On the turn with a board of A-Q-4-7, Josh Spiegelman made a $500K reraise and The Grinder folded. Josh Spiegelman showed A-A for a set of aces. The Grinder made another big laydown today. 9:05pm... Main Event update: John D'Agostino took down a big pot from Amnon Filipi to move into 4th place in chips with over $900K. 9:15pm... Main Event update: Kenny Schuyler from Long Branch, NJ has been eliminated in 10th place by Amnon Filipi. He won $27,718. Filipi flopped a set of 3s to Schuyler's top pair and all the money went into the pot on the flop. 9:35pm... Main Event update: The past hour has been the John D'Agastino show. he picked up another pot, this time against John Mullis and now his stack is well over a million. He has $1.2M in chips. 9:45pm... Main Event update: Players are on a break. 9 left. 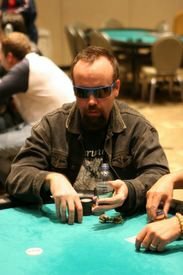 Lindgren is still the chipleader. 10:00pm... Main Event update: We're on Level 22. Blinds are $15K/$30K with a $4K ante. 10:12pm... Main Event update: Erick Lindgren has increased his lead to over $2M and has almost as many chips as second and third place combined. 10:20pm... Main Event update: Plenty of pros are here sweating the final 9 players and checking out the action including Gavin Smith, David Williams, Andy Black, Kathy Liebert, Paul Darden, and Efro. 10:40pm... Main Event update: Nothing to report. Action has slowed down and players have tightened up. 10:51pm... Main Event update: The Grinder was involved in a monster pot, probably the biggest of the day and of the tournament. The Grinder busted Don Mullis in 9th place when his Q-Q held up against J-J. Mullis won $46,196. Down to 8. The Grinder jumped ahead of Lindgren in the chiplead with over $2.4M. 11:10pm... Main Event update: Joe Miceli has been eliminated in 8th place and won $55,436. His K-Q lost to John D'Agostino's 10-9. On a flop of Q-J-7, Miceli moved all in and D'Ags called. He turned a straight and sent Miceli to the rail. 11:30pm... Main Event update: Players are on a break. The Grinder has the chiplead. 11:35pm... Main Event update: We're on Level 23. Blinds are $20K/40K with $5K antes. Seven players left. We're playing until one more player gets busted. 11:43pm... Main Event update: Peter Feldman has been eliminated when his A-A got cracked by Josh Spiegelman's A-K. He bubbled out of the TV table. Both players were all in preflop. Josh Spiegelman turned a straight with a 10-J-Q on the board and sent Feldman to the rail. Feldman won $73,914 and earned his seat in this event by winning a satellite online. The final table will start at 5pm on Wednesday. See you there. We're back for day two of the World Poker Tour Borgata Winter Poker Open main event at the Borgata Casino Hotel & Spa in lovely Atlantic City, New Jersey. Yesterday, 381 players forked over $10,000 each for a shot at the main event championship and a 2006 Escalade. First place will win over $1.1 million and the top 75 players will win prize money. There are 165 players remaining looking to survive day two. 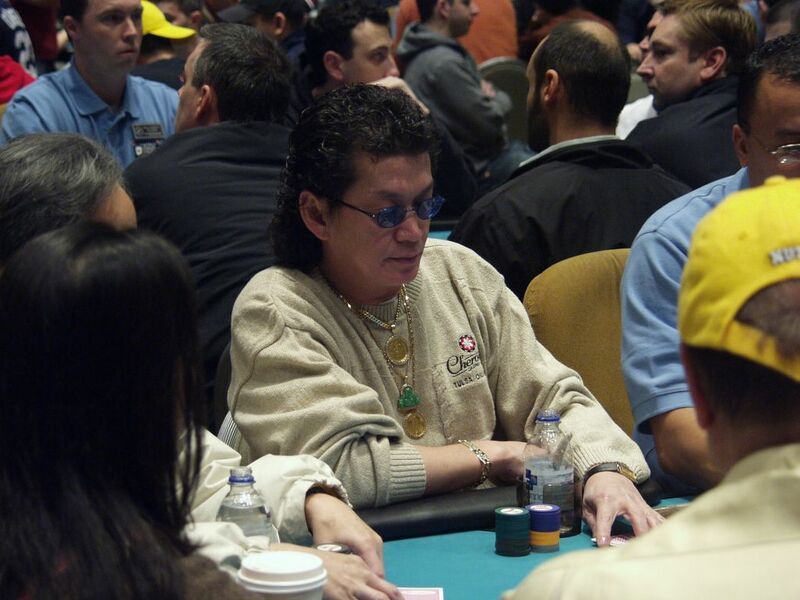 Cliff "Johnny Bax" Josephy ended the first day as the chipleader. There are plenty of pros still in the mix including Eric Seidel, David Williams, Joe Sebok, Nick Frangos, Chris Fargis, The Grinder, Freddy Deeb, Barry Greenstein, Action Bob Hwang, Steve Dannemann, Scotty Nguyen, Andy Black, Bill Edler, Ted Forrest, Matt Hilger, Matt Matros, Dan Alspach, Joanne Liu, Ammon Filippi, John D'Agostino, Alan Giehring, Brian Haveson, Denis Ethier, Carlos Mortensen, Syracuse Chris, Tony Cousineau, Gavin Smith, Jean-Robert Bellande, Matt Glantz, and Kenna James. Event #2 winner Micahel Hickman from Media, PA is 3rd in chips. 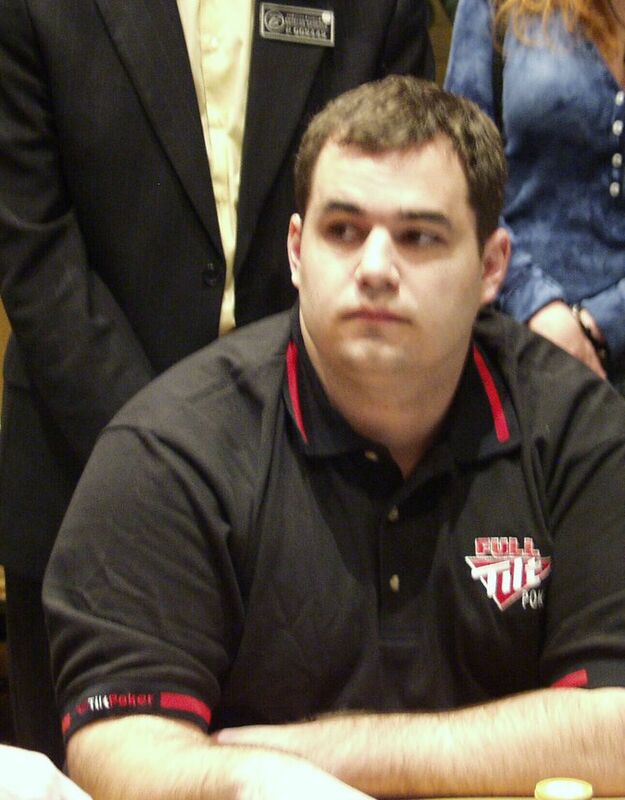 Notable eliminations from Day 1 included Wayne Stock, Victor Ramdin, Daniel Negreanu, John Phan, Kathy Liebert, Antonio Tarver, Al Ardebili, John Gale, Olga Varkonyi, Pat White, Layne Flack, David Oppenheim, Jerry Burgess, Manny Minaya, Russel Rosenblum, Arnold Spee, Carlos Zambrano, Daniel Shiff, John Phan, Bruce Yamron, Eric Froehlich, Philippe Rouas, James Van Alstyne, Massoud Nikjouian, James Salters, Nenad Medic, Tom Sipes, Roland Israelashvili, Arthur Azen, Frank Kassela, James English, Larry "Zekeness" Lawson, Stephen Benton, Chip Jett, Bill Gazes, Paul Darden, Phil Ivey, Mike Gracz, Laura Fink, Emad Alabsi, Dan Shak, Padraig Parkinson, Fritz Stoner, Chris Bell, Eric Weiner, Scott Neuman, William Failla, Chad Brown, David Harris, Neal Gersony, Badih Bounabura, David The Dragon Pham, Matthew Hoagland, Josh Arieh, Steve Jacobs, Surinder Sumar, Amir Vahedi, Stephen Benton, Irv Gotti, David Levi, James Giordano, Allen Cunningham, and Dax Funderburk. 11:03am... Main Event update: Players are seated and they are opening up their bags. Action will begin shortly. 11:08am... Main Event update: Cards are in the air. We're on Level 9. Blinds are $600/1200 with a $200 ante. 11:15am... Main Event update: Lisa Pickell is out. 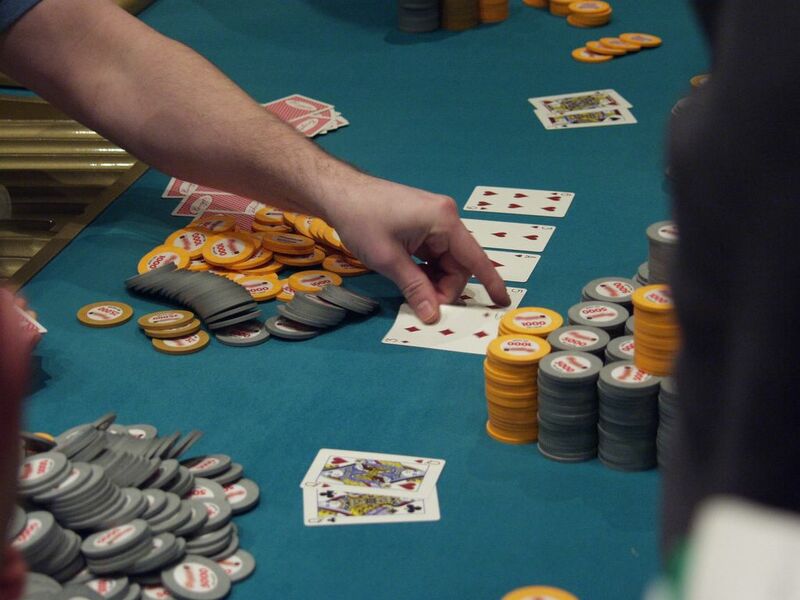 11:30am... Main Event update: Several players have already been busted. 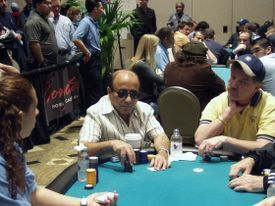 At Chris Fargis' table, three players were eliminated in three hands. 11:50am... Main Event update: Today's action features nine-handed tables. There are 16 tables left. Approximately 143 players remain. 12:05pm... Main Event update: Gavin Smith is out when his 7-7 ran into K-K. Nicky Frangos ran into John Juanda's K-K.
12:45pm... Main Event update: 116 players left on 13 tables. That information comes straight from the tournament director Tab Duchteau. Chris Fargis busted Fabrizio Birona when he flopped a straight with 5-3s. 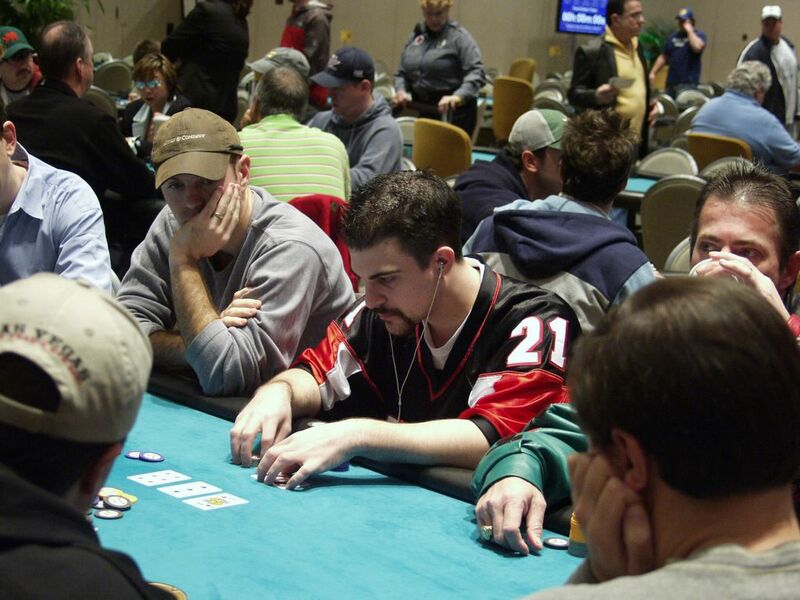 Action Bob doubled up against Dan Alspach when his A-K held up against Alspach's 9-9. 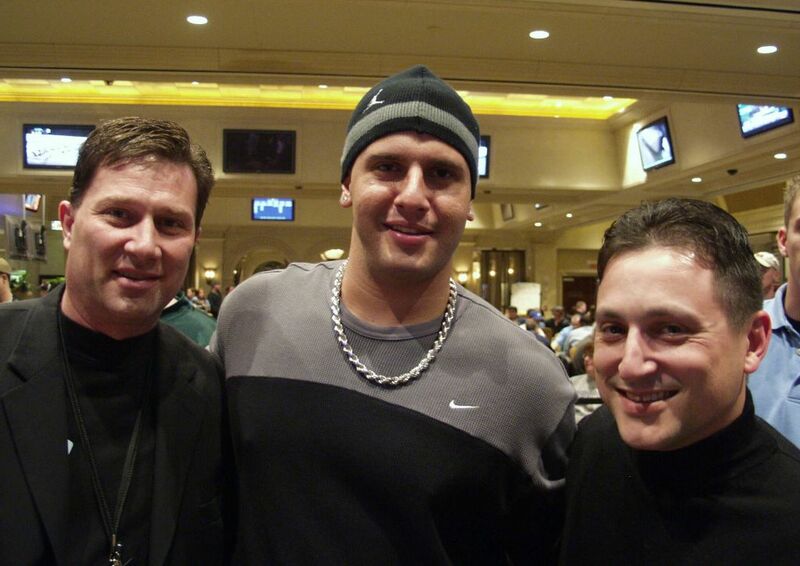 Robert Mizrachi was busted by Tex Barch. 1:30pm... Main Event update: 106 players on 12 tables. Chris Fargis' took a hit. David Williams was busted when he ran into A-A. Matt Matros ran into an overpair and was busted. 2:10pm... Main Event update: Players are returning from a break. We're on Level 11. Blinds are $1K/2K with 300 blinds. 102 left on 12 tables. Chris Fargis has 86K. Cliff Josephy has almost 400K. Action Bob has about 60K. 2:30pm... Main Event update: Steve Brecher has been eliminated. 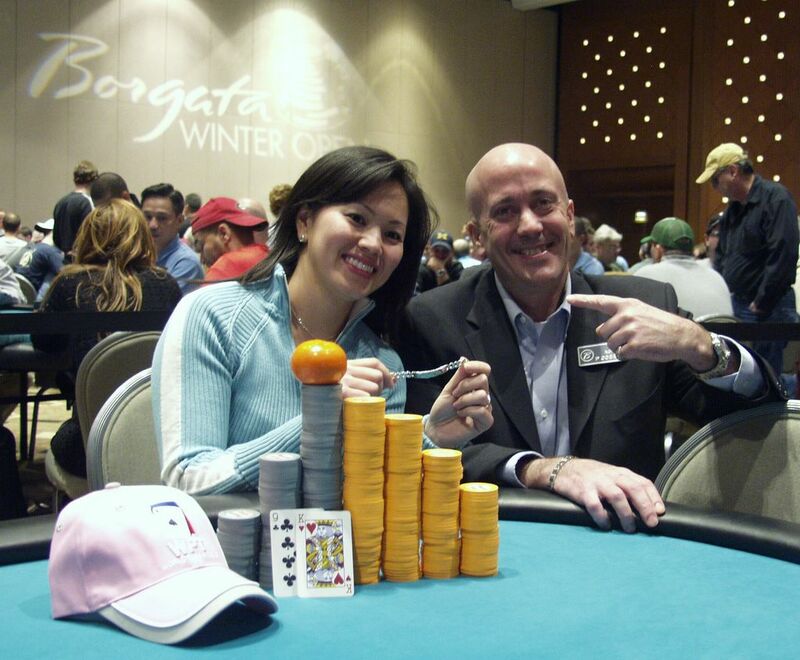 2:50pm... Main Event update: Joanne Lui was busted when her K-J ran into J-J. 3:15pm... 10 tables left. 90 players remain. Tex Barch stares down an opponent. 3:25pm.... Main Event update: Steve Dannemann was just eliminated when his A-Q lost to Mike Maler's J-10. Maler rivered a straight. Andy Black has $130K. 3:30pm... Event #10 $500 NL update: There's one final event that began today. 457 players entered that event. 3:32pm... Main Event update: Players are on a 15 minute break. Action Bob Hwang was busted by Richard Kirsh when his A-K lost to J-8o. On a board of 6d-9d-8s-2d, Action Bob moved all in for almost 40K. His opponent ended up calling with J-8o. Action Bob had Big Slick and the King of diamonds. The river was an 8 and Action Bob was sent to the rail. 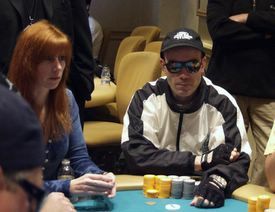 4:00pm... Main Event update: Cliff Josephy has almost 400K, while Erick Lindgren is in the top 5 chips with over 320K. 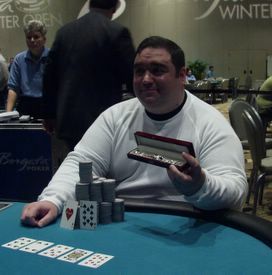 Chris Fargis lost a big pot when his Big Slick lost a race to Jorge Arias' Q-Q. 4:10pm... Main Event update: There's a Miss America sighting here in the ballroom! The place was buzzing for several minutes as she walked around and took photos with everyone and visited the players. Stay tuned for photos of Jennifer Berry from Frank Bellocchio. 79 players remaining. 4:35pm... Main Event update: 77 players. Chris Fargis has les than 40K. Andy Black has 130K. John Duthie has 180K. Louise Francouer has 110K. Joe Sebok has 92K. Mark Nantis took over the chiplead from Cliff Josephy. 4:56pm... Main Event update: Michael Hickman was just busted along with Mark Puma. One more until the bubble. Chris Fargis was on the brink of elimination. He was all in preflop with A-K against Tommy Wang's K-K. He riverd an ace to double up and stay alive. 5:00pm... Main Event update: Players are on a 15 minute break. 76 left. Bubble Time. Vinod Vangimalla is still in with 60K or so. 5:30pm... Main Event update: Still on the bubble on the verge of busting. John D'Agostino has run up his stack to over 420K. 5:37pm... Main Event update: Andy Black dropped the Hammer!! Black raised with 7-2o. No one called his raise and he flipped over his hand. "I wanted to get called," he said. "I want to win a pot with 7-2!" 5:52pm... Main Event update: Ted Forrest has been eliminated on the bubble by Eugene Todd. As Bubble Boy, the Borgata will be buying him into the 2006 September Borgata Open. Everyone left will be making the money. 6:10pm... Main Event update: Chris Fargis is out. 6:35pm... Main event update: 63 players remaining. It's all over, baby. Scotty Nguyen was elimianted in 66th place when he missed a nut flush draw with Ah-8h. He lost to J-J. 7:00pm.... Main event update: A few more bustouts as we approach dinner time. John D'Agostino is still in the lead. Andy Black lost a hand with the Hammer! 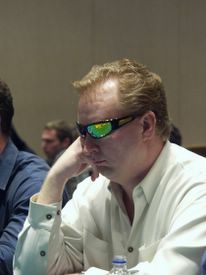 With 7-2 he flopped bottom pair and called Don Mullis' all in bet. Mullis had Q-J and totally missed the flop. He turned a Jack to double through Andy Black. 7:15pm... Main Event update: 59 left. Players are on a dinner break. 8:10pm... Main Event update: We're back from dinner. We're on Level 14. Blinds are $2K/4K with a $500 ante. 8:20pm... Main Event update: Tommy Wang is out in 59th. 8:30pm... Main Event update: Andy Black is out in 58th place. 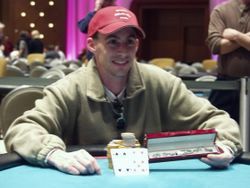 His A-Q ran into Erik Seidel's A-K. Padraig Parkison was on the rail sweating Andy and rooting him on. When Andy busted, he looked upset. Padraig: "Cheer up. Nobody died. How much did you win?" Padraig: "Not bad for a day of work. That's more than Santa Claus makes." 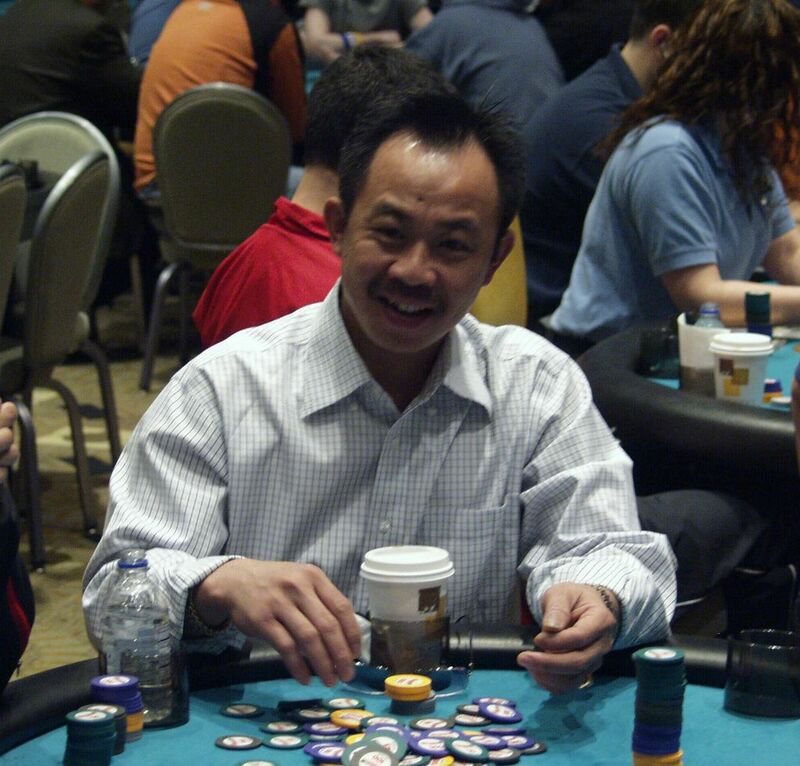 8:40pm... Main Event update: Feming Chan was just eliminated in 57th place when he ran into Cliff Josephy's A-A. 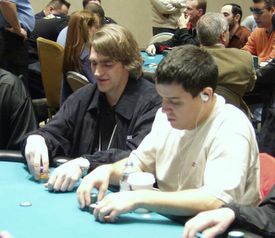 A few hands before, Peter Fedlman doubled up against Cliff Josephy when his pocket eights held up againt Josephy's K-J. 8:45pm... Main Event update: Joe Sebok was busted in 56th place when his A-Q lost to Q-Q. 9:15pm... Main Event update: 50 players left. The bustouts are coming quick. Bill Edler and James Fletcher are the chipleaders. Fletcher has over 500K. 9:20pm... Main Event update: 47 players remaining. Robert Weitzner, Richard Aquinto, and Curt Kohlberg are out. The players are on a break. 9:35pm... Main Event update: Players are back from their break. We're on Level 15. The blinds are $3K/6K with a $500 ante. Johhny Bax is back in the chiplead! He cracked A-A with 5-7o. 9:50pm... Main Event update: Bill Edler busted James Fletcher. Albert Muir is also out. 10:20pm... Main Event update: Erick Lindgren scooped a monster pot with a Royal flush! When he hit the Royal, he said he'd be happy to wear a Borgata hat. 41 left. 10:40pm... Main Event update: Down to 41 players. Avergae stack is 232K. 10:45pm... Main Event update: John Duthie doubled up with A-Qs vs. Alan Schein's J-9s. Pete Skyllas busted two guys in one hand; Brian Haveson and Bill Kaczynski. 39 players left. Players are on a break. 11:11pm... Main Event update: We're on Level 16 with the blinds at $4K/$8K and a $1K ante. This will be the last level of play tonight. 11:28pm... Main Event update: We're down to 36 players. 11:35pm... Main Event update: We're down to 33. Play is done for tonight. We'll resume play at Noon on Tuesday. 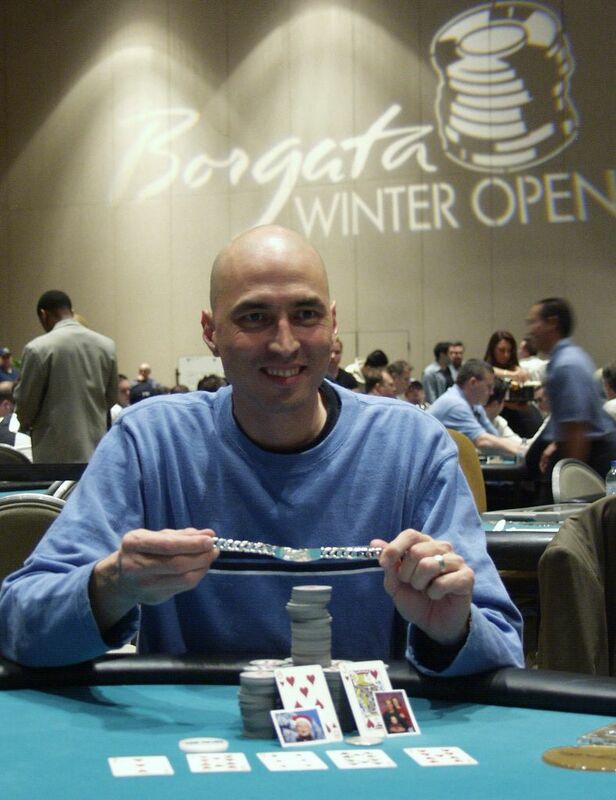 John D'Agostino is the chipleader with almost $1M. The average stack $288,636. This is the event we've all been waiting for!! 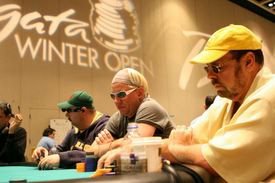 Today is the first day of the $10K championship event of the Borgata Winter Open at the Borgata Casino Hotel & Spa in Atlantic City, NJ. This is a World Poker Tour sanctioned event and the final table will be taped for the WPT. 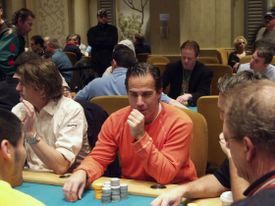 Yeah, over the next four days the Borgata will be the center of the poker universe while some of the biggest names in poker are slugging it out for the Borgata Winter Poker Open Championship, while plenty of semi-pros, locals, and amateurs are taking a shot at the big time. So will a well-known pro take this event down? 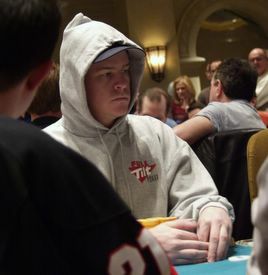 Or will an unknown emerge as poker next superstar? The winner of this event will also win a fully loaded 2006 Escalade. Right now we have around 376 players in this event and I'll post official numbers when they are available. 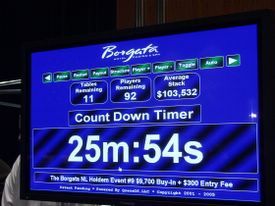 Over the past ten days, the Borgata had been hosting smaller buy-in events. They crowned eight champions, all of whom won a coveted Borgata bracelet. 11:10am... Main Event update: Cards are in the air. 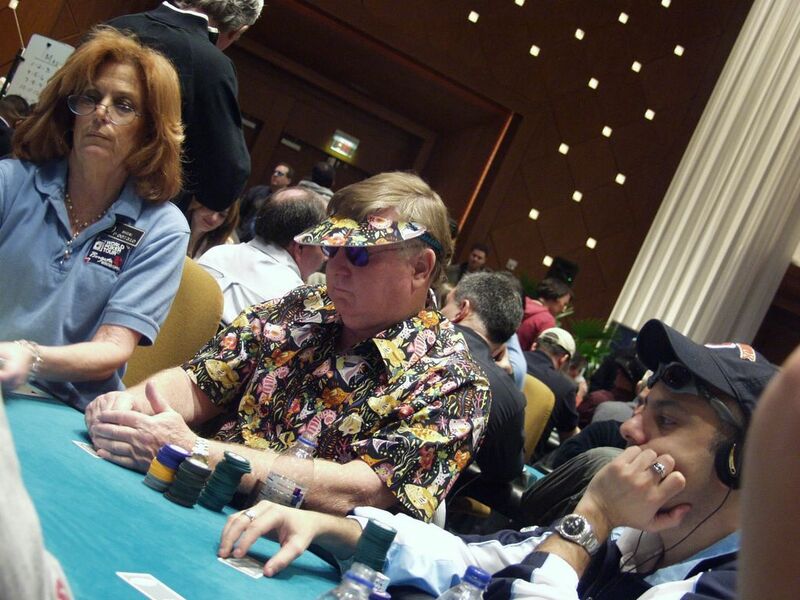 Buy-in is $10K and players start with $25K in chips. The level are 75 minutes or one hour and fifteen minutes. 11:25am... Main Event update: We have our first bust out. 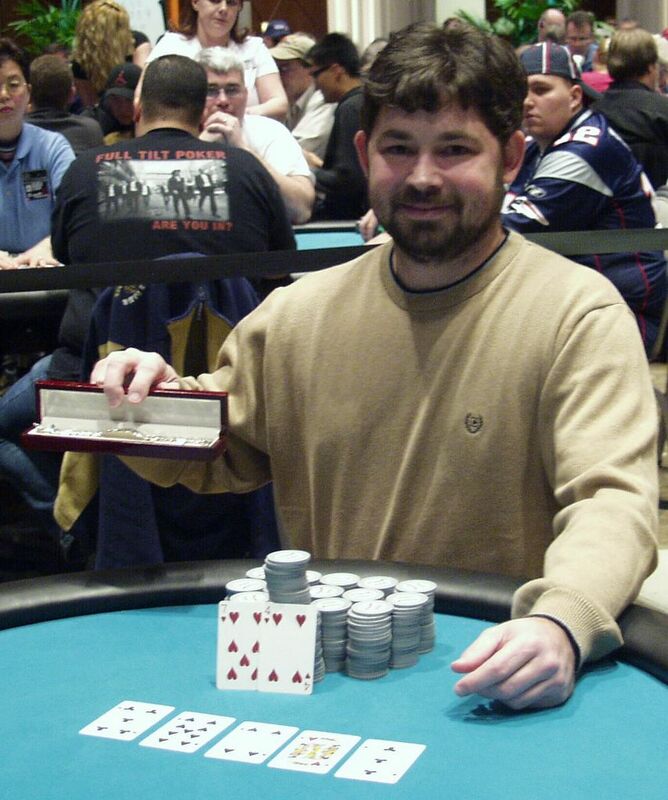 Event #8 winner Tom Sipes was busted by David "The Dragon" Pham, who now has over $50K and is the early chipleader. Matt Hilger has 36K. 11:30am... Main Event update: After a quick walk through the tournament area, I spotted several big time pros playing in today's event. Daniel Negreanu, Bill Gazes, Chris Fargis, Matt Matros, Josh Arieh, David Williams, Joanne Liu, Denis Ethier, Erik Seidel, John Juanda, Chip Jett, Gavin Smith, My Main Man Freddy Deeb, Kathy Liebert, John D'Agostino, Steve Brecher, The Griner, Johnny Bax, Matt Hilger, Olga Varkonyi, Gentleman John Gale, Mike Gracz, Brian Haveson, Arnold Spee, James Van Alstyne, Paul Darden, Robert Varkonyi, Surinder Sumar, Syracuse Chris, Action Bob Hwang, Phil Ivey, Erick Lindgren, John Phan, Nick "Takeover" Shulman, Padraig Parkinson, Kenna James, Barry Greenstien, Carlos Mortensen, John Duthie, Al Ardebili, Stephen Benton, Allen Cunningham, Scotty Nguyen, Andy Black, Joe Sebok, Jean Robert Bellande, and Tex Barch. 12:00pm... Main Event update: 381 players and the top 75 will play. Stay tuned for payout information. 12:25pm... Main Event update: Players are currently on a 15 minute break. Action Bob was at a table with Jean Pobert Bellande, Erik Seidel, John Juanda, Joe Sebok, and Nick Schulman. 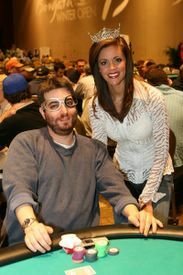 1:00pm... Main Event update: John Duthie took an early hit when his K-K ran into a set of aces. He doubled up just now and is about even. 1:45pm... Main Event update: Wayne Stock from NYC was busted when his K-K were cracked by pocket fours. His opponent rivered a set. Arthur Azen, who won an 2006 Escalade this week, was just busted. 2:00pm... Main Event update: Players are currently on a break. When they return, we'll be on Level 3. Payouts have been released. First place will win over $1.1 million and a brand new Escalade. 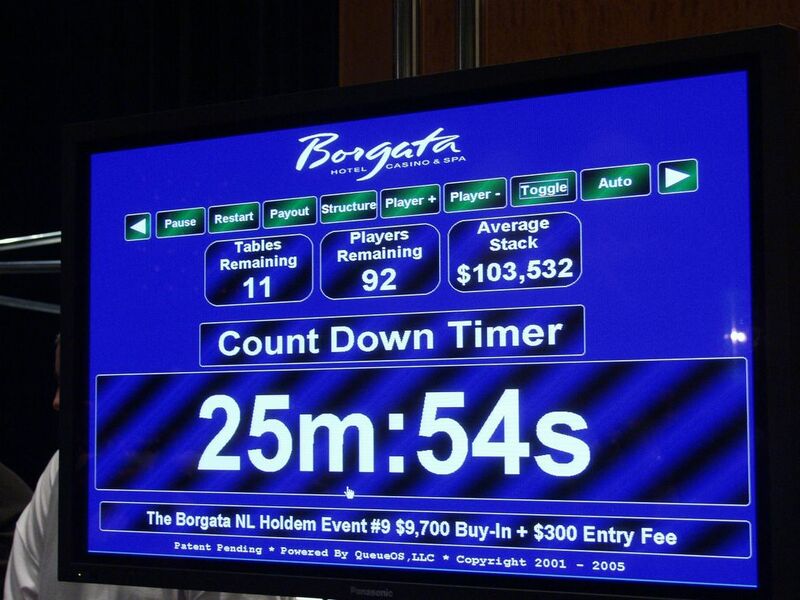 3:00pm... Main Event update: There are 36 tables and 357 players remaining. Layne Flack just arrived! John Duthie has 55K, as does David The Dragon Pham. John Gale's stack took a hit and he has 13K left. Andy Black has almost 50K in chips. Recent eliminations include Efro, Victor Ramdin, and John Phan, who was eliminated when his A-Q lost to K-J. 4:00pm... Main Event update: 340 players left including boxer Antonio Tarver. We're on Level 4. Blinds are $100/200 with a $25 ante. Arnold Spee is out. James Van Alstyne and Russel Rosenblum are both out. 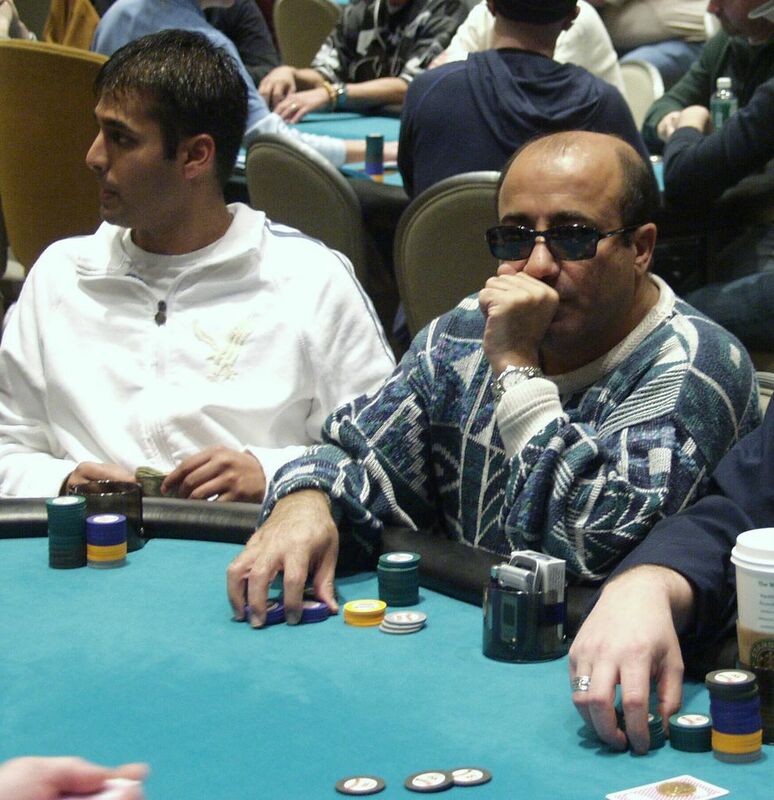 Freddy Deeb appears to be among the chipleaders as his stack past the 90K mark. Joe Sebok has 38K and Andy Black has 48K. 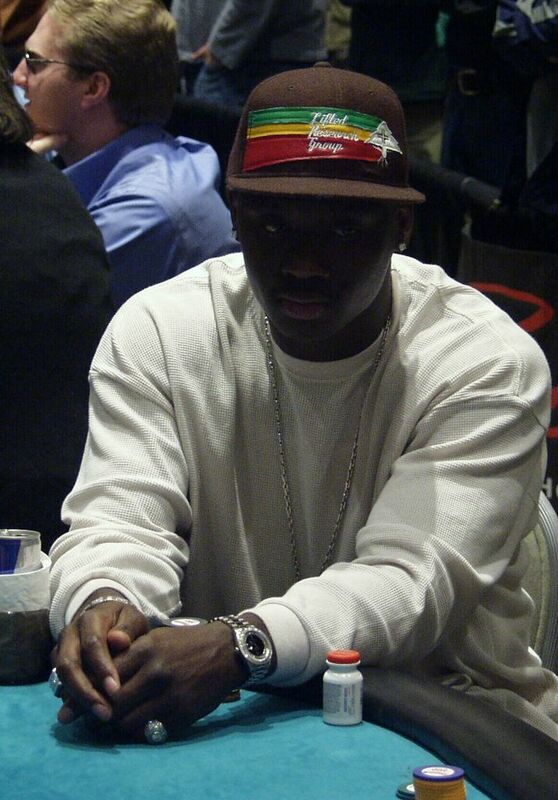 4:30pm... Main Event update: Antonio Tarver lost a monster pot to Gavin Smith. Tarver flopped two pair, but Smith turned a set. Tarver has 7K while Smith has about 70K. 5:00pm... Main Event update: Players are on a break. Layne Flack is out. Padraig Parksion has around 40K. 5:45pm... Main Event update: Antonio Tarver was busted by Gavin Smith. The two had been rumbling all afternoon. Smith flopped a flush and Tarver mucked. He told me he had two pair. David Singer has been busted. Andy Black has 48K and Padraig Parkison has around 25K. 6:00pm... Main Event update: Here are some photos taken my in-house photographer Frank Bellocchio. 6:05pm... Main Event Update: The Grinder took over the chip lead and now has over 100K. The 2005 Borgata Open Champ Al Ardebili has been eliminated along with John Gale and Olga Varkonyi. 8:05pm... Main Event Update: 235 players left on 24 tables. Players are on a dinner break until 9:05pm. Here's what's happened in the past hour or so... Larry "Zekeness" Lawson was eliminated when he flopped a King with Big Slick and ran into someone who flopped a set. Andy Black built up his stack after he busted Emad Alabsi with a nut flush. Black had over 75K at that point. Bill Gazes was busted when his K-K were snapped off by 9-9. 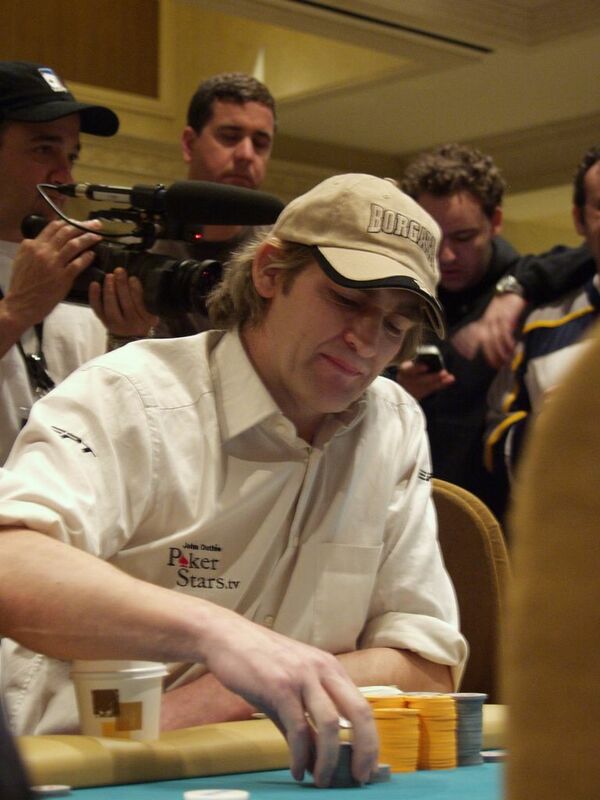 Erik Seidel took over the chiplead after he scooped a big pot and the Grinder took a hit. 9:30pm... Main Event update: Padraig Parkison is out. Scott Neuman is out. His Kings were cracked by pocket sevens. 10:00pm... Main Event update: Nick Schulman's A-6 was busted by Steve Dannemmann A-K. Andy Black has 63K and is sitting at Joane Liu's table. 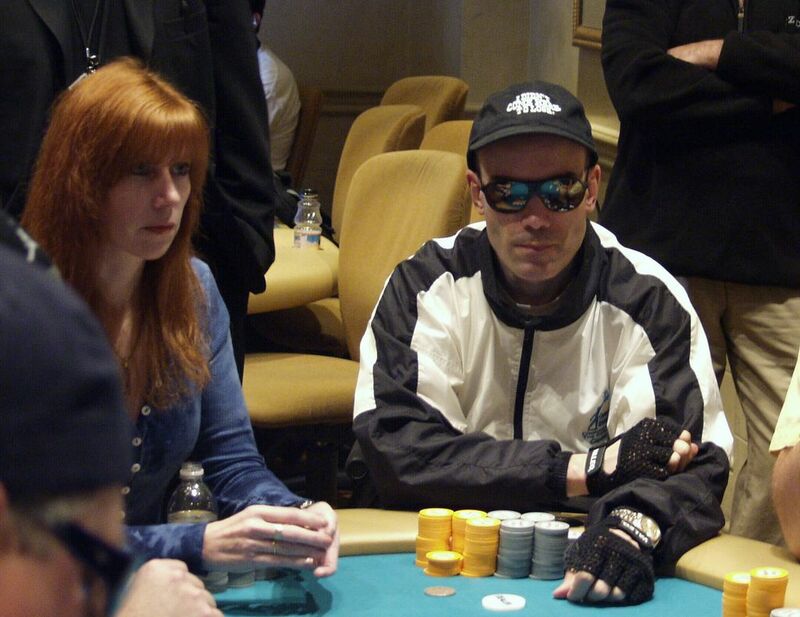 Cliff Josephy aka Johnny Bax is the chip leader with 213K. Robert Varkonyi, Kenna James, Erik Seidel, and Denis Ethier and Charis Chris Fargis are all at the same table. 10:30pm... Main Event update: Players are on a break. Chris Fargis has 30K. 11:00pm... Main Event update: 188 players left on 19 tables. This is the last level of play for today. 11:30pm... Main Event update: 25 minutes remaining in this level. 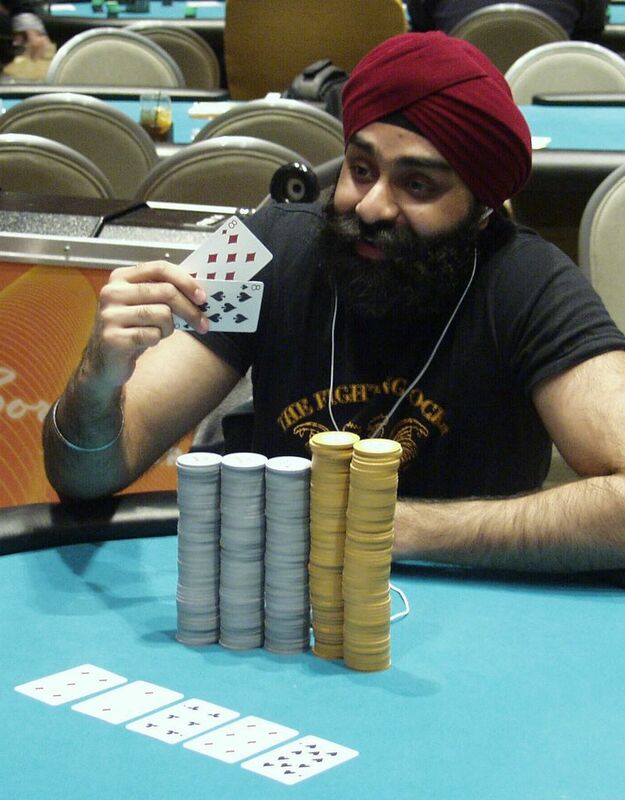 Surinder Sumar and Amir Vahedi have both been eliminated. Stephen Benton is also out. Andy Black has over $105K.